Matt Fleming of Bangor (right) goes up for a shot and collides with Ross Webb of Hampden Academy during Thursday night's basketball game in Hampden. Broncos (from left) Kent Oliver, Kory Winch and Bryce Lausier look on. The Rams won 64-50. 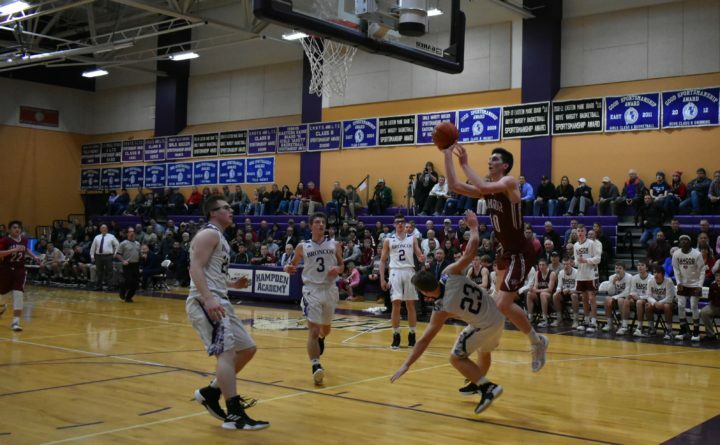 HAMPDEN, Maine — The Bangor and Hampden Academy boys basketball teams shared more than the court Thursday night. They shared the pain of a teammate in Marc Hutchings, the Hampden senior who suffered multiple injuries during an early morning truck accident on Wednesday and is recuperating at Northern Lights Eastern Maine Medical Center in Bangor. Hutchings had spent his first two years of high school at Bangor, so players from both teams know him well. When the neighboring rivals met for the first time this winter, they began the evening with a moment of silence for Hutchings, his family and themselves. Then, with Hutchings watching via live internet stream from his hospital bed, they battled for 32 minutes with Class AA top seed Bangor gradually pulling away from Class A Hampden for a 64-50 victory. Bangor used a 15-2 second-quarter run to take control en route to a 32-25 halftime lead. 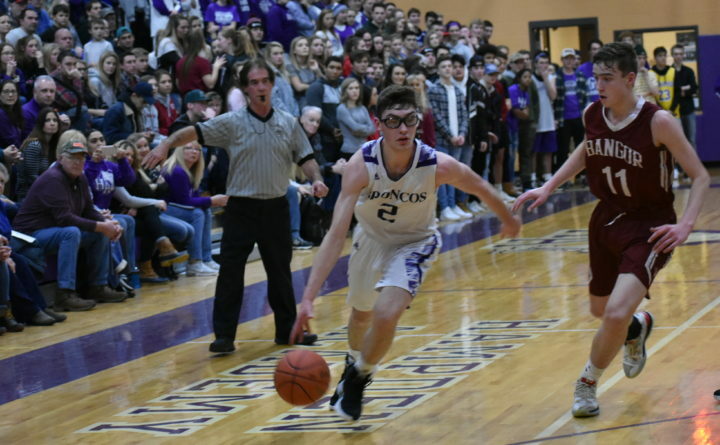 That surge included a run of 10 unanswered points that featured 3-pointers from reserve forward Jason Smith and junior forward Henry Westrich — another of Hutchings’ former middle-school teammates. Bangor finished the game with eight 3-pointers from six different players, including two each from long range by senior guard Isaac Cummings and senior forward Noah Missbrenner. After Lausier scored twice on offensive putbacks to open the third quarter and cut the Broncos’ deficit to 32-29, two 3-pointers by Cummings, one by Missbrenner and six transition points by senior forward Matt Fleming helped Bangor stretch its lead to 51-40 by the end of the period. Hampden’s Kory Winch converted a reverse layup to make a nine-point game early in the fourth quarter, but Fleming and Luke Caruso countered with 3-pointers and Bangor’s lead was up to 15 at 57-42 with five minutes to play. “I thought we had great energy off the bench from Luke and Jason,” said Bangor coach Brad Libby. “Luke hit a couple of big shots, Jason hit a big three for us, Noah hit a few big shots for us and it really changes the other team’s defensive mindset because they might not be able to sag off as much and it opens everything up. Fleming scored 12 of his team-high 18 points after intermission and also finished with 10 rebounds for 9-1 Bangor, while Cummings scored 12 points, Vance had 10 and Westrich and Missbrenner added eight points each. “Their ability to shoot the ball around Matt is what makes them really tough,” said Bartlett. “They’re able to keep the (defensive) helpers away from Matt, and he’s almost unstoppable on the block so you’ve got to overcommit your help to that. Lausier scored a game-high 23 points with 11 rebounds for 7-2 Hampden while senior center Kent Oliver, starting in place of Hutchings, contributed 12 points on 6-of-10 shooting from the field. “I really think we’re jelling well together,” said Westrich after Bangor extended its latest winning streak to three games against opponents in Thornton Academy of Saco, Edward Little of Auburn and Hampden that now sport a combined 22-5 record.